After the fall of the goddess of justice, temple assassin Aral Kingslayer lost his purpose in life and turned to the bottle. That might have been the end of him if luck hadn’t given him a few people to help him get back on his feet—notably the irresistible Baroness Maylien Dan Marchon, who once sought his aid in claiming the throne that’s rightfully hers. Reluctant to resume the role of an assassin, he turned her down. 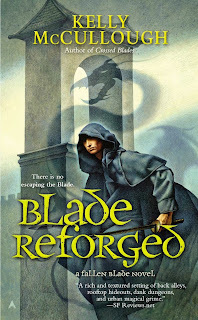 Blade Reforged by Kelly McCullough is the newest book in the Fallen Blade series. It’s been years since the goddess of justice fell, and temple assassin Aral, also known as Kingslayer has no purpose in life. He’s fallen into the bottle, and without help from his Shade Triss, and other friends, he might very well have ended up a dead assassin. However, the Baroness Maylien Dan Marchon, who once asked for his help in regaining her lost throne has been declared an outlaw by her uncle, King Thauvik. It’s either let a friend be killed or take up the role of Kingslayer again. But, it was the death of Thauvik’s half brother that made Aral a Kingslayer, and if he takes on the name again, he won’t be able to stop until he’s proved that he’s earned it. There’s a civil war looming, and as Maylien works to form alliances, Thauvik reveals that he has his own assassins, or Blades that answer to him, and one of them is so formidable that they would have been a challenge for Aral at the top of his game. Now, he has to think on his feet, and try to regain the prowess that he had before the goddess fell in order to bring down a king that is mad with power and deeply corrupt. McCullough excels at describing the characters’ states of minds and decisions in such a way that the reader understands both how incredible they are and makes them seem a little bit less insane. Characters that had received only some development in previous books are fleshed out more in this installment, and Maylien gets a share of the spotlight. In addition, the world gets expanded upon, and events from previous books are referred to, but not hashed out again in detail. 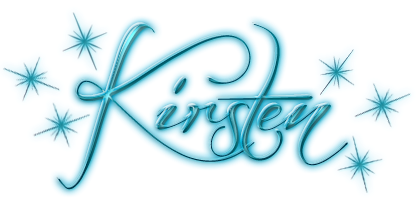 As far as future books, the repercussions of this one could play out in a number of ways, and there’s always work for a Kingslayer, Aral is willing to take on the job again.